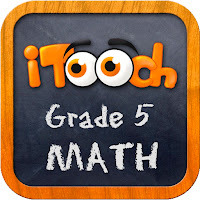 This app was great to use for math practice and quizzes for the students. I teach 6th grade, but I found that the 5th grade app matched our current curriculum ( may differ with Common Core). There is a practice mode and quiz mode. I would allow the kids to practice until they thought they were ready for test. Once they score popped up, I had them take a screen shot and email it to me. Some days I would tell the kids what to work on, other days, I allowed them to pick what they would like to work on.